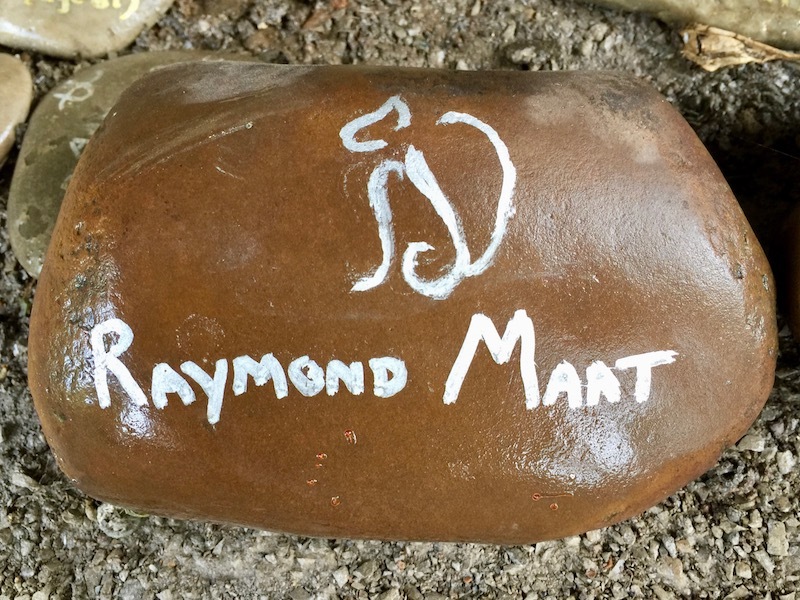 As memorials go, it’s a strange one. At a small clearing along a bicycle trail sits a rectangular raised plot, bordered by river stones, about the size of a modest backyard garden. The ground is staked with 18 short lengths of white PVC pipe. 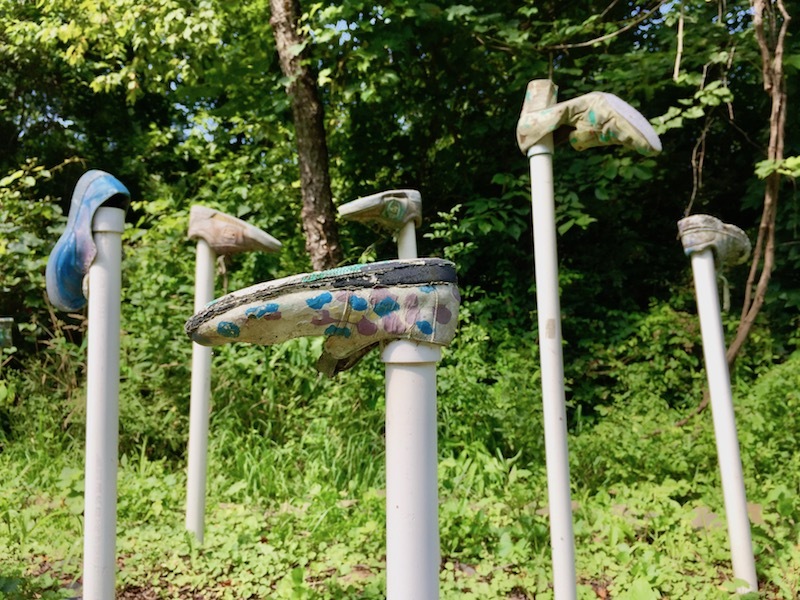 Each has an article of decommissioned footwear firmly attached, its sole turned toward the sky. None of the shoes match and they appear to come from a variety of sources. There are women’s dress shoes with chunky heals, rubber-soled trainers, and comfortable sneakers. Though most are adult models, some of the shoes are sized for a small child, while others would fit a still-growing youth. All have been decorated with after-market paint jobs, now disintegrating after years (?) exposed to the elements. Kimberly Rutkowski’s obituary features just the bare minimum information. Her residence was listed as South Fayette, a large suburban township just west of where the memorial lives now. She was survived by a husband and two children. As the stone tells us, Ms. Rutkowski died in January, 2005. She was just 43. 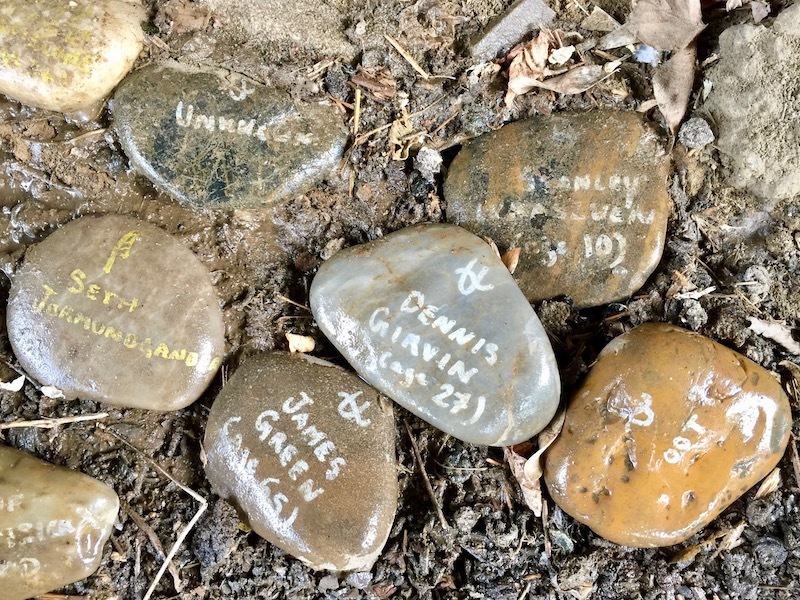 As obituaries tend to do–or not do, as is the case–there is no real personal detail to go on. We don’t know what Ms. Rutkowski cared about or did for fun, what she dreamed of or was made crazy by. We don’t even know what she looked like. 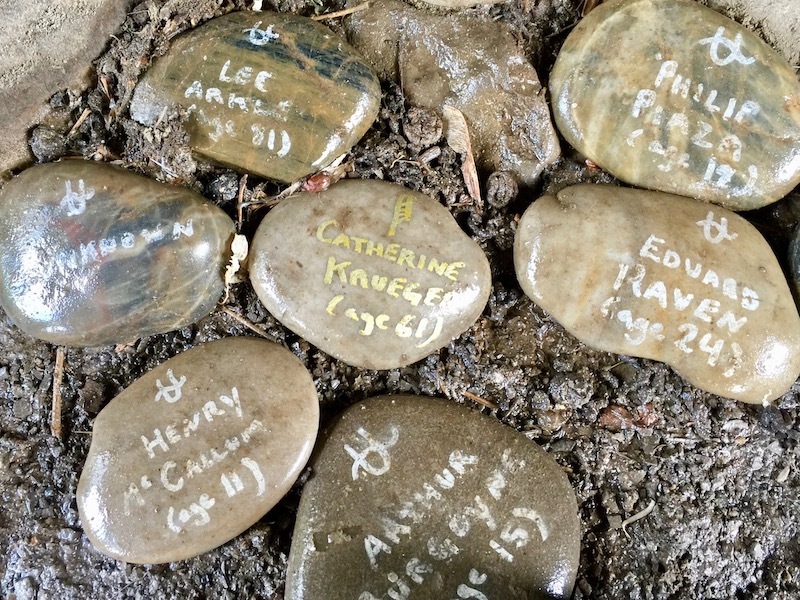 But for those of us who never got to meet Kimberly Rutkowski, we can at least share the abstract experience-by-association of putting our best foot forward through the loving, humorous, and thought-provoking memorial in Collier Township. The Panhandle Trail starts or ends (your pick) in Rennerdale, just a few miles past Carnegie. It runs 30 miles due west to the outskirts of Weirton, West Virginia. It’s a lovely, easy ride through gentle, rolling hills, lush full summer overgrowth, and comes replete with all manner of scurrying creatures, circling hawks, babbling brooks, and eye-popping wildflowers. It also features a number of human-created attractions, including a bunch of small towns and country hamlets the former Pennsylvania Railroad used to serve before the tracks were replaced with trail. Along the way is a former quarry, a congenial bicycle shop, and enough little restaurants to sate trail-generated hunger almost anywhere along the line. Bike-to-beer fanciers will find the newish Helicon Brewery right along the route in Oakdale. 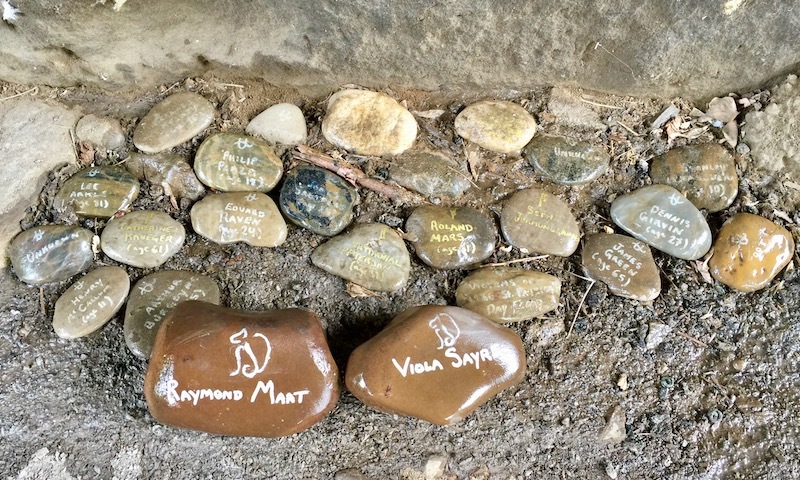 These are all wonderful accompaniments to a thoroughly-enjoyable bicycle trek, but it was the Rutkowski memorial that kept the Orbit office buzzing for days after we finished the ride. 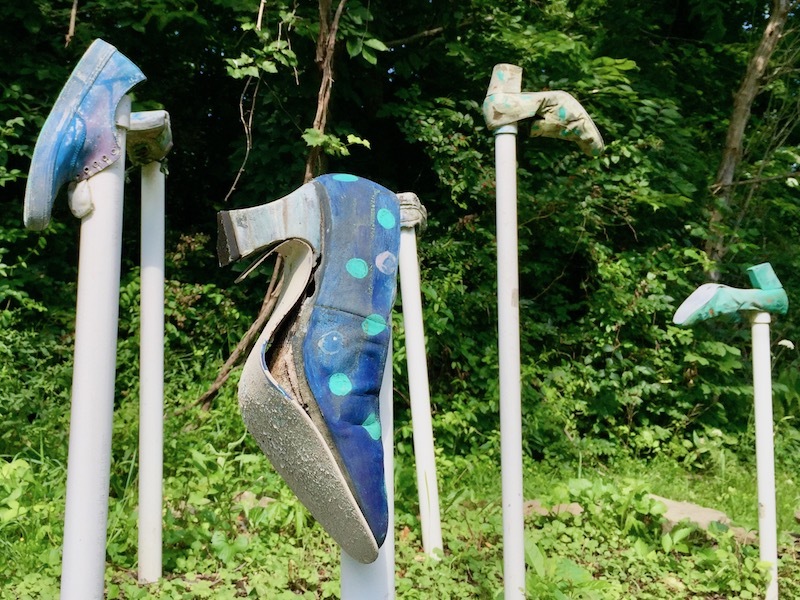 Like all great art, the shoe memorial asks more questions than it answers. 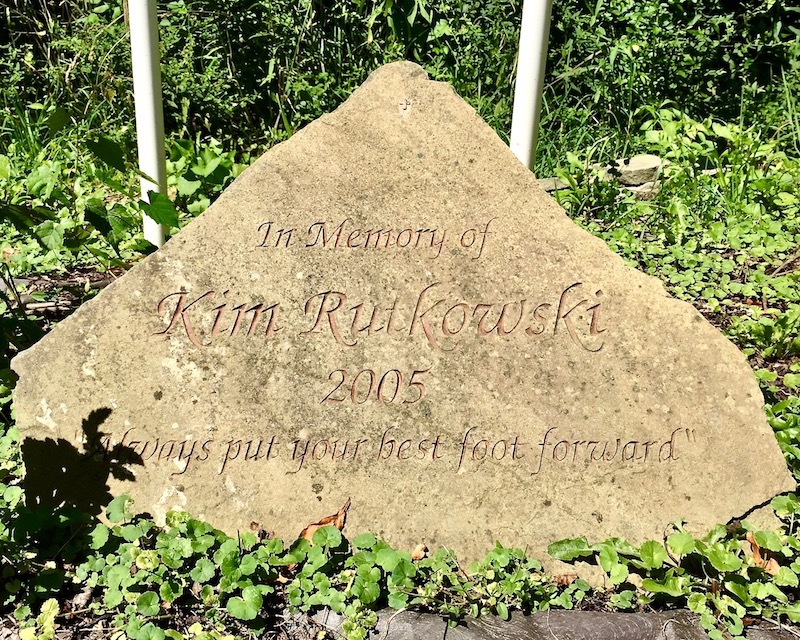 Was “always put your best foot forward” such a repeated catch-phrase that Ms. Rutkowski’s friends and/or family needed to take it to the next level? Was the deceased herself in on the design? How and why did the creators select this plot of trailside ground? We just don’t know. So we’re left to wonder and come up with our own personal interpretations. 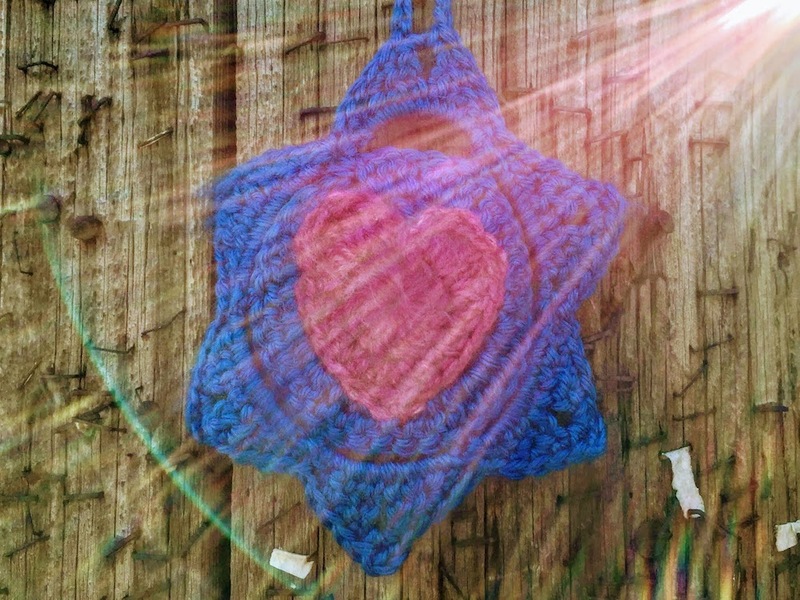 There was a time in this blogger’s early life when 43 would have seemed like a ripe old age. Those days–just like that particular birthday–have long since passed. Forty-three is young! Or, at least, it’s what we think of as middle-aged. We know we’re not owed anything in this life, but in one’s early forties we hope to still have nearly as many tomorrows as we had yesterdays. 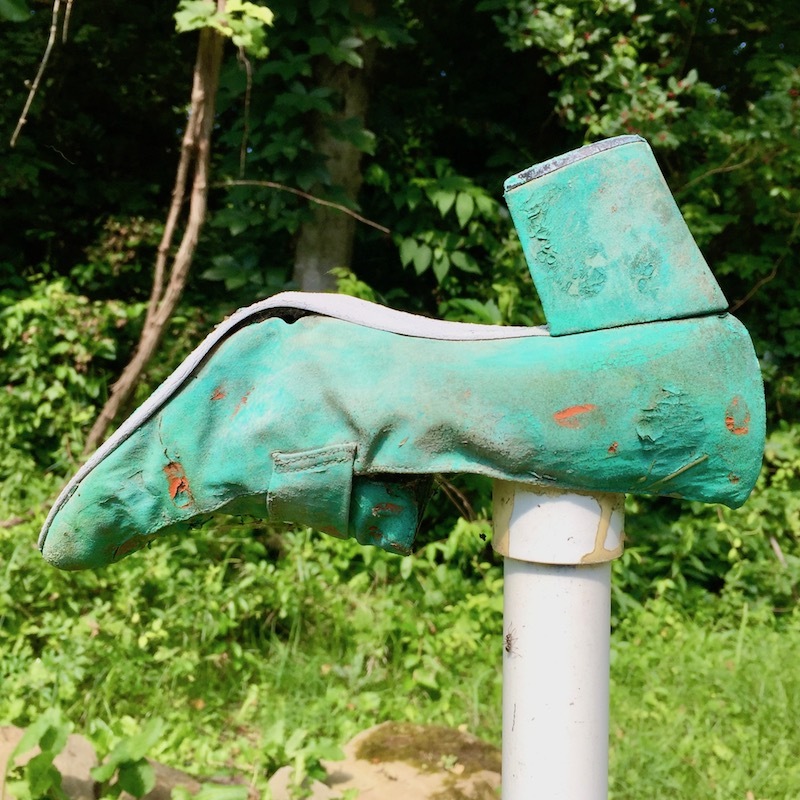 So, the next time you find yourself on The Panhandle Trail [yes, make sure there is a next time] take the opportunity to pause for Kimberly Rutkowski and her tribute of second-hand pumps and discarded jogging shoes. We’ve only got so much time on this earth–make sure to not only put your best foot forward, but wear those shoes to the nub when you’re doing it. 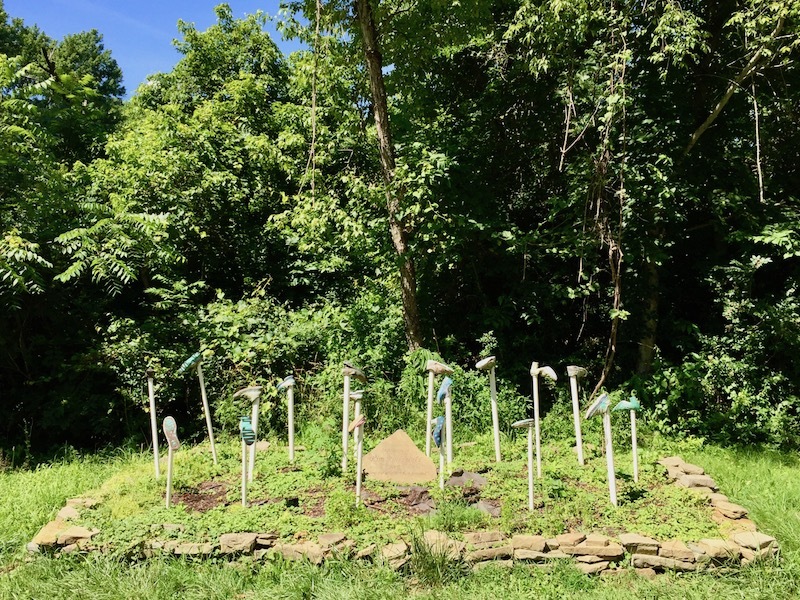 The Rutkowski shoe memorial, Panhandle Trail, Collier Twp. Getting there: The Panhandle Trail has its own web site with maps and all the relevant information on trailheads and route. The Rutkowski shoe memorial is on the eastern end of the path, between Rennerdale and Oakdale. A simple cross. Each spar a length of white PVC pipe a couple feet long with the ends capped and sealed. There is one heavily-sun-bleached Christmas wreath attached to the piece and another lays in the grass just in front. Also at the scene is a small, hand-painted, ceramic angel. Peel-and-stick letters on three ends of the pipe describe only the most basic details: Mark, 66-02. 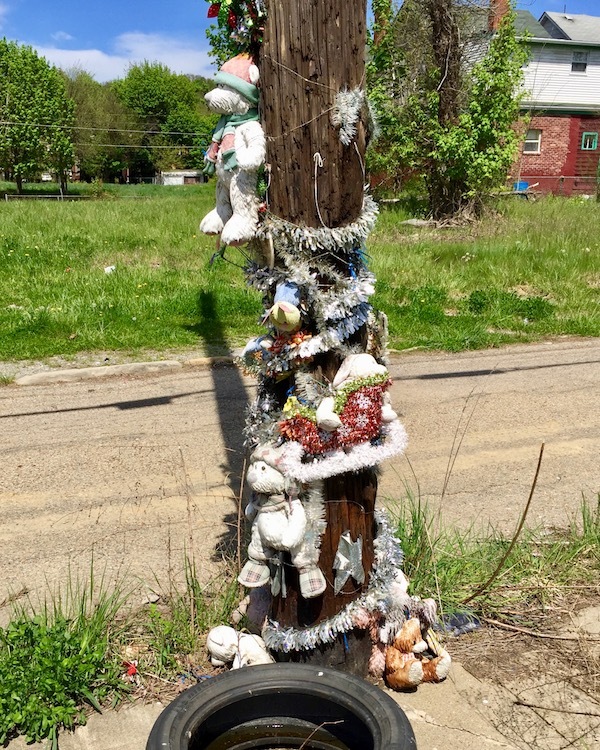 Years ago, the makeshift memorial was hammered into the grass of a wide berm along Route 837 in West Elizabeth. 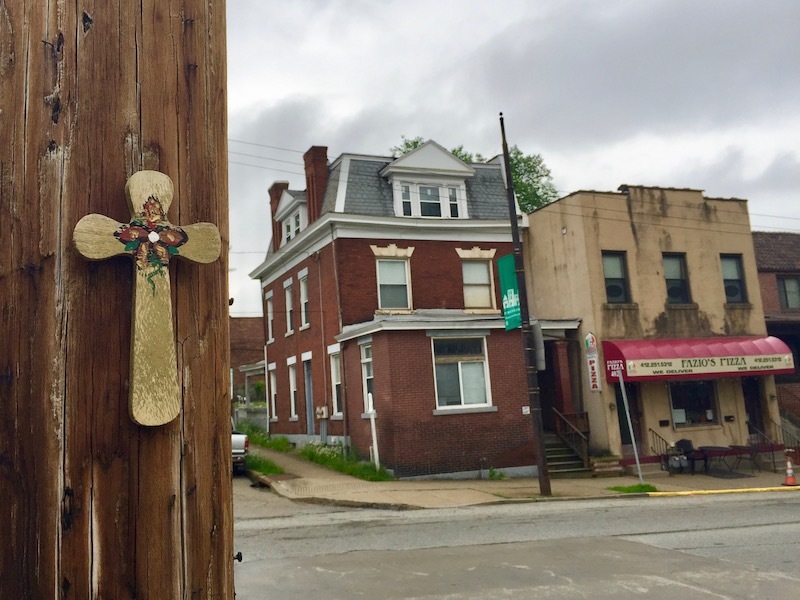 We pass the cross on every trip down to Donora and Monessen, so it’s become a kind of mile marker in this industrial stretch that includes a number of small factory buildings along with large operations for Eastman Chemical Resins and Marathon Petroleum. 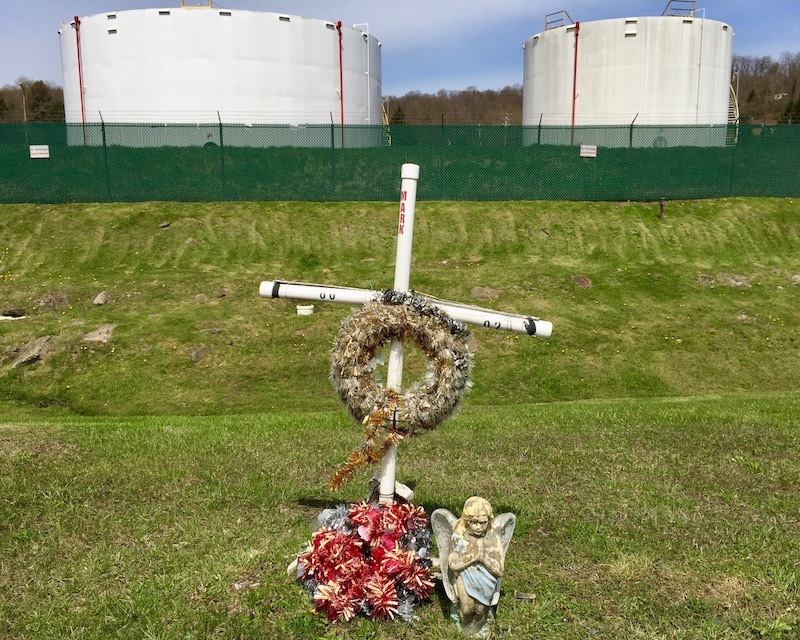 The enormous, stories-tall gas reservoirs of the latter form an imposing backdrop to the very human-scaled and personally-tended roadside cross put up for the departed. Memorial Day means a lot of things to a lot of different people. It was created to honor those men and women who’ve died in military service for the country and has morphed into the great long weekend of igniting propane under chicken thighs after deeply-discounted blowout sales at department stores and car dealerships. 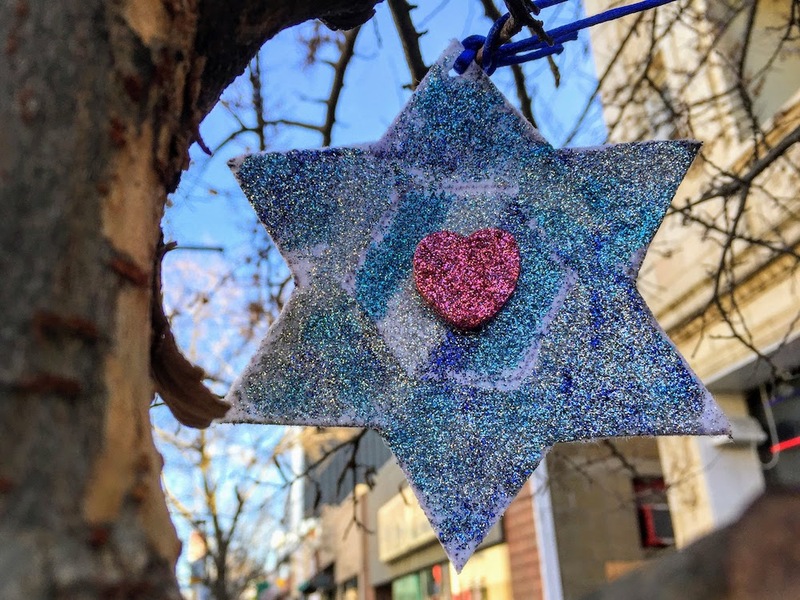 While those interpretations of the holiday are all valid, The Orbit finds a profound depth in the very personal and extremely individual work of making and tending these unique tributes that seem to pop up just about anywhere. There’s a lot we don’t know…and will never know just by randomly passing a roadside cross with someone’s first name. Somewhere out there–for any accident that’s resulted in fatality–there must exist the blunt facts of a police record or newspaper obituary. 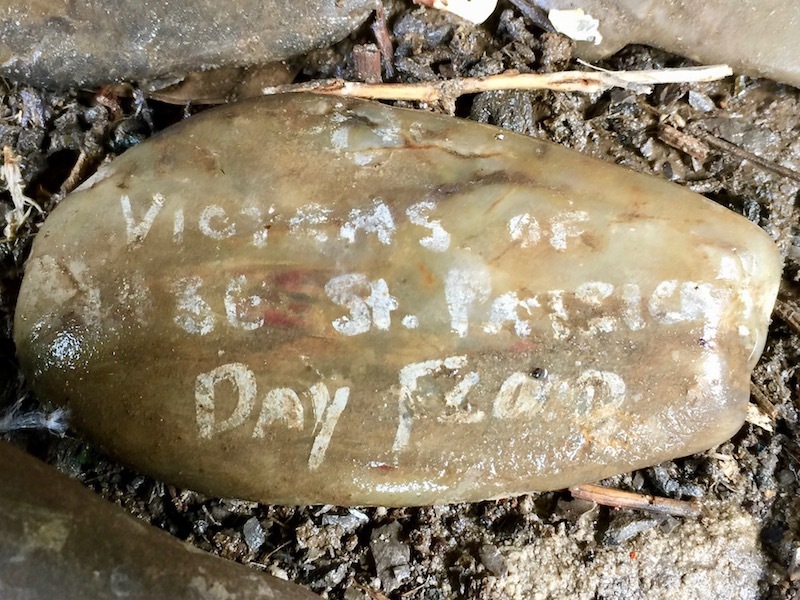 But even with the clues provided–a firefighter’s helmet, a stone painted with the Harley-Davidson logo, an unexpected location along the bicycle trail–the memorials generate more questions than they answer. 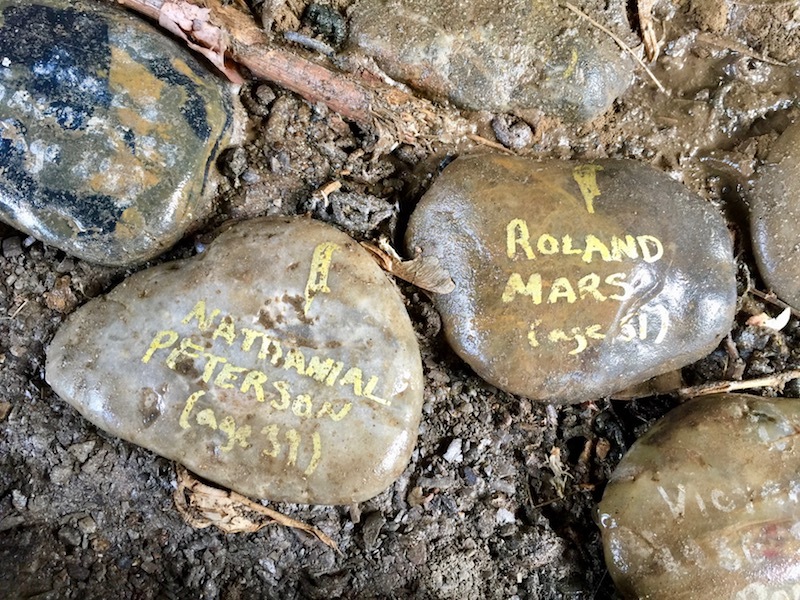 Whatever happened to Mark, Ryan, Jordan, or any of the others remembered in these roadside crosses, it probably wasn’t a happy ending. 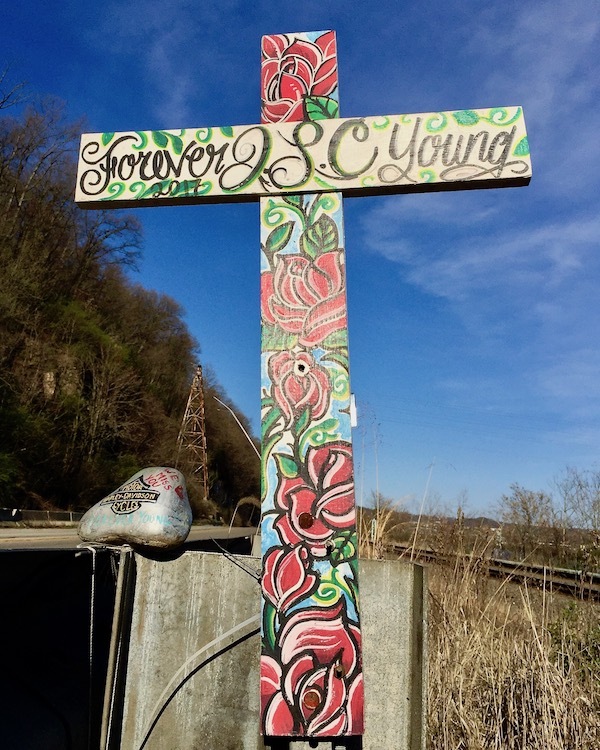 Their ages–from late teens to mid-thirties–and placement of the crosses (mainly) along busy roadways suggest unexpected, unnatural deaths. These seem likely to be car crash-related, but of course those details are part of what remain a mystery. The most important unknown, for the vast majority of us, is the character of these people whose lives were cut short on the two-lane blacktop. They were clearly loved and are missed with a reverence we should all be so lucky to have. 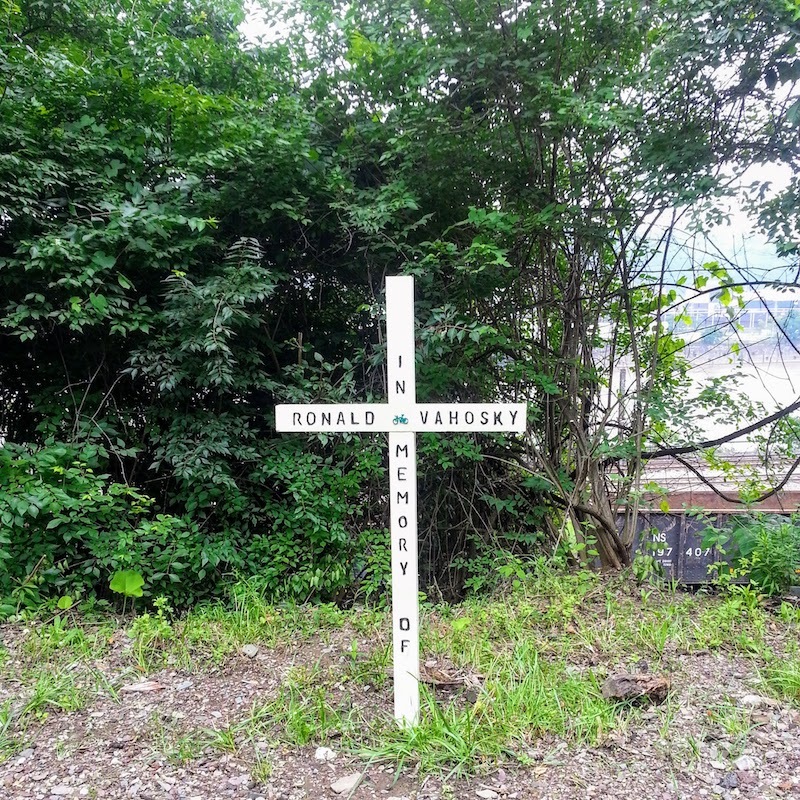 The Orbit spends a lot of time in the graveyard; very few marble headstones get the loving upkeep of some of these lashed-to-a-guardrail wooden crosses. 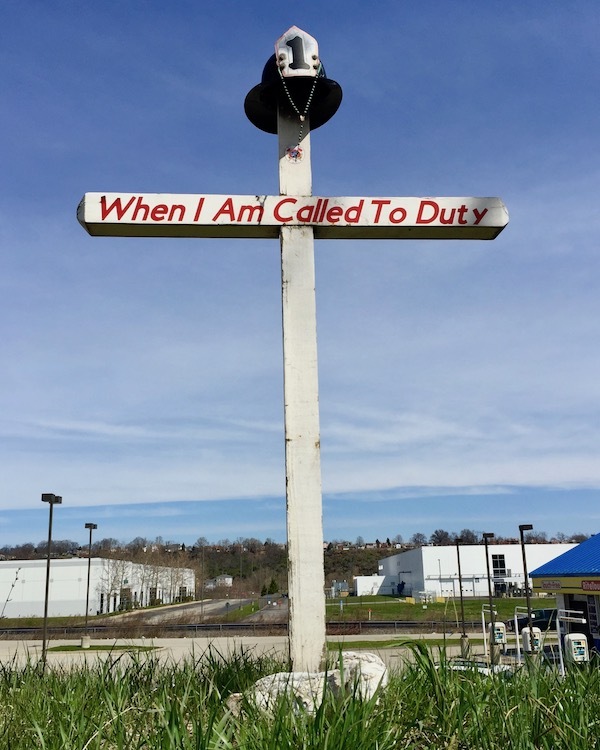 Back to that anonymous roadside in West Elizabeth–graveled and dusty, noisy with truck traffic, and surrounded by the petrochemical industry. 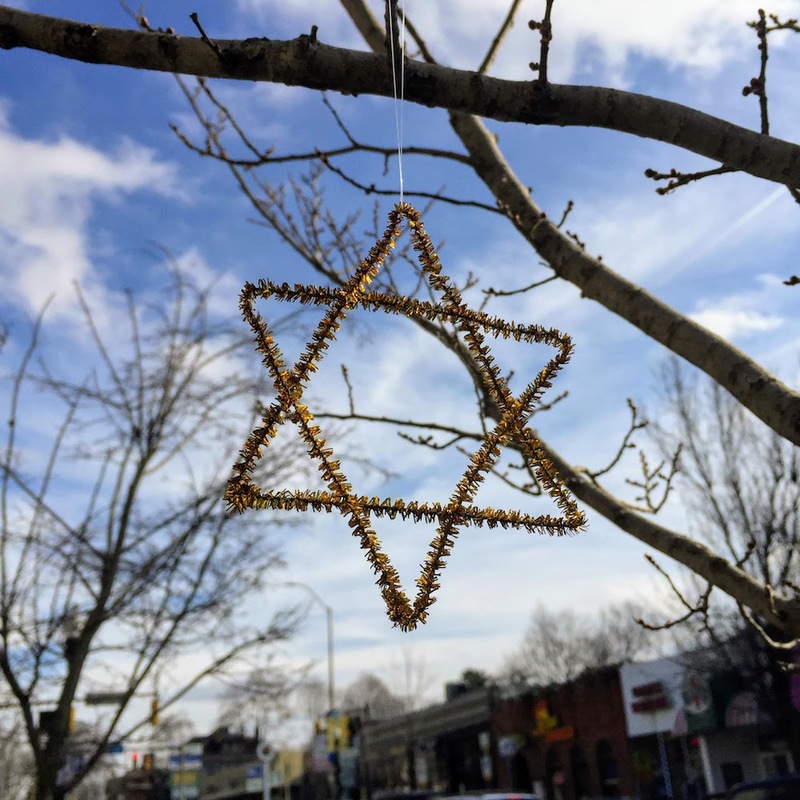 It has none of the solemn peace, flowering dogwoods, frolicking deer, or generations-old sculpted beauty of Allegheny or Union Dale Cemeteries. It offers neither the great cross-river views of St. John’s and Loretto nor the rock star lineup at Homewood. But…this is where it happened. 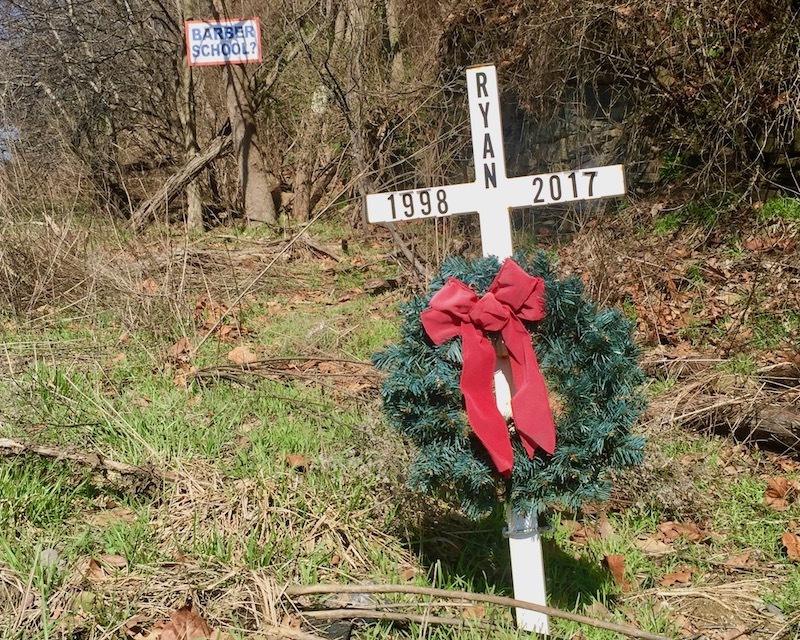 And for the people who loved Mark and Vincent, Ryan and Jordan, these lonely stretches of ex-urban highway seem to have become hallowed ground in a way that may never seem completely appropriate for more pristine, formal burial grounds. Roadside crosses, though not obviously memorials, showed up in a couple other places on our travels. 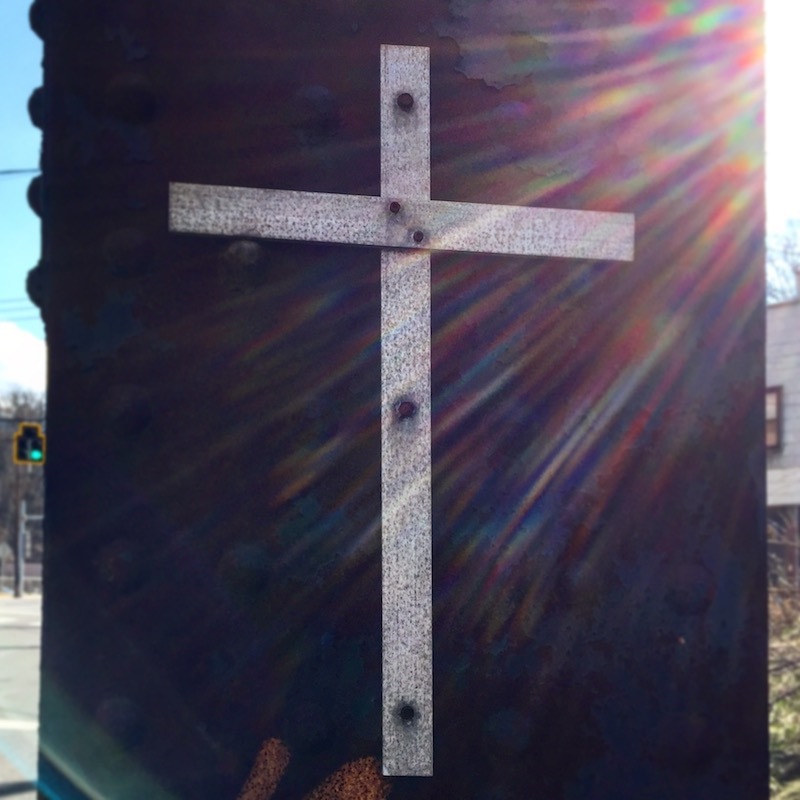 These anonymous acts of faith–a metal cross on steel girder (above) and old world painted wood cross on utility pole (below) come with even less to go on. Do they remember a specific traffic fatality like the more personalized examples above? 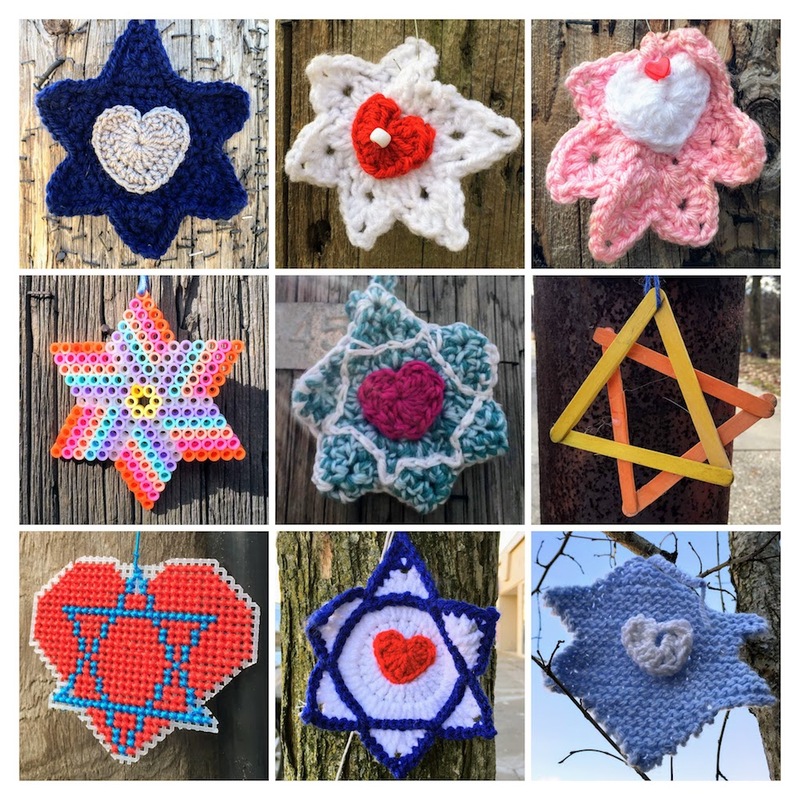 Or do these crosses have nothing to do with an individual or specific intersection and just represent a quiet-but-public expression of religious belief? There’s a couple more here, too. 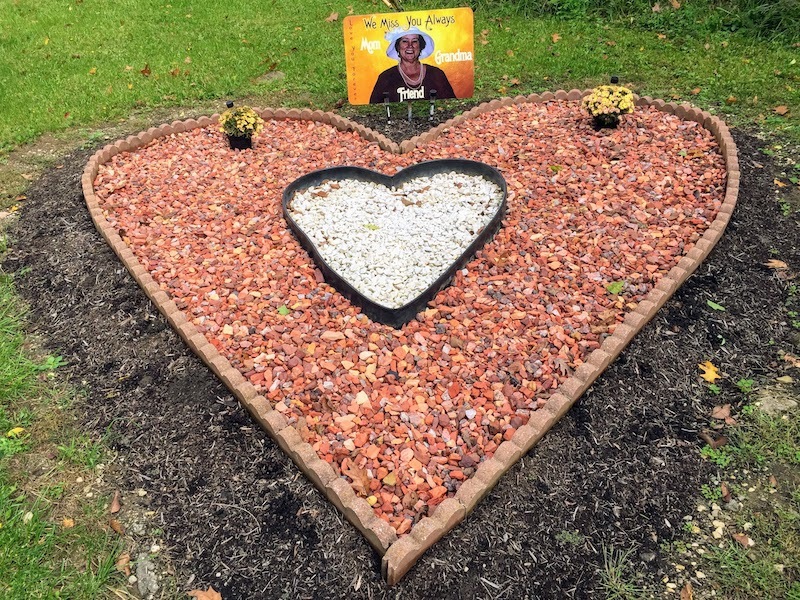 This loving, heart-shaped and patio-sized tribute to “mom / grandma / friend” on Route 51 is hard to suss out. 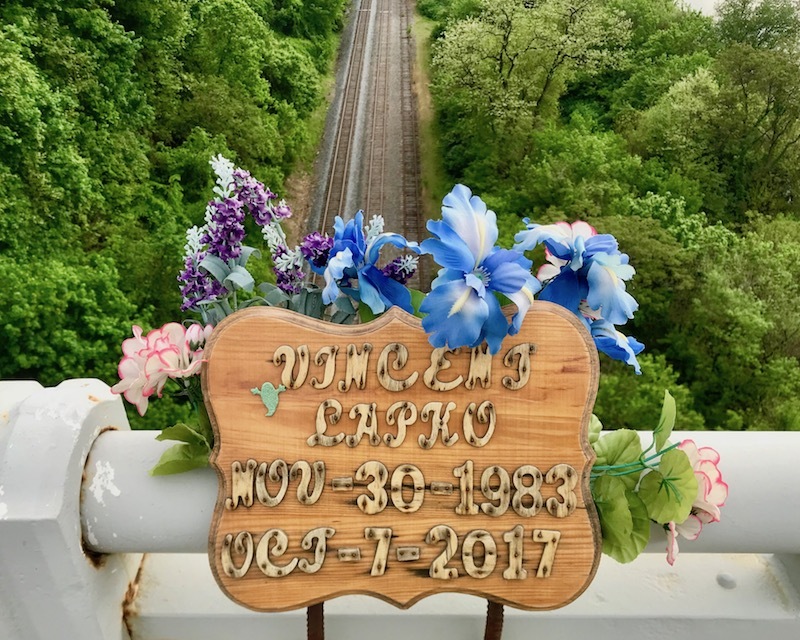 Did grandma pass away at this stretch of highway [it’s as likely as anywhere] or did the family just decide to landscape their elaborate memorial in a naked roadside where the greater Coraopolis/Moon Township commuter community could pay their respects? Who knows! Finally, the one that really hits home. We wrote a while back about the ghost bicycle for Susan Hicks in central Oakland and went into a whole spiel about putting our faith in robots. We’ve been fortunate enough that there haven’t been too many other cycling fatalities in the city since then. 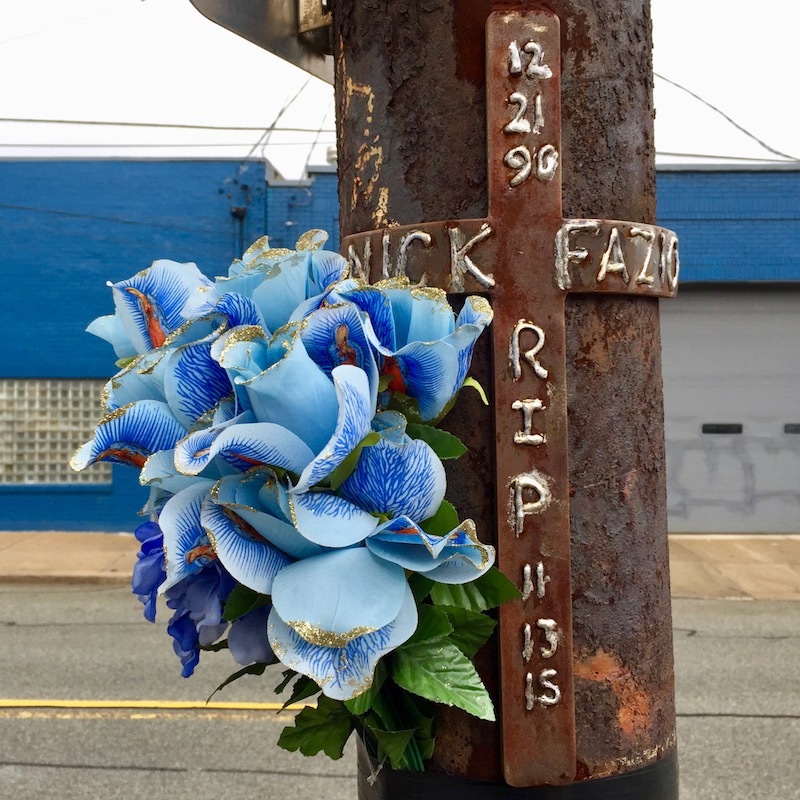 One painful exception is Dennis Flanagan, a cyclist who was killed riding on a fast-moving stretch of West Carson Street in 2016. 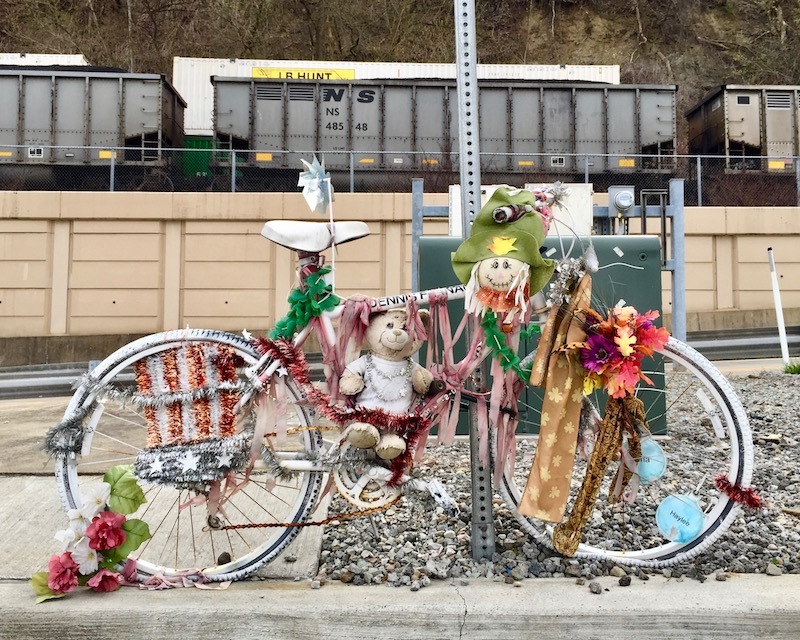 For the ghost bicycle left to mark the spot of Flanagan’s fatal accident, the teddy bears have faded, plastic flowers droop, gears and chain are rusty. But the painted-white bicycle remains, locked to a street sign faithfully reminding passers-by that Dennis Flanagan was here and we all need to look out for each other. That’s what Memorial Day means to me. Against deep blue sky and thick green long-overgrown grass, the fuzzy little bodies pop from the chain link fence they cling to. Tigers, monkeys, floppy-eared dogs and bunny rabbits fill the ranks, as do a lion, zebra, and giant duck. We didn’t know dinosaurs could be cuddly and furry, but there’s one of those too. Overwhelmingly, though, the majority in this population is the teddy bear. 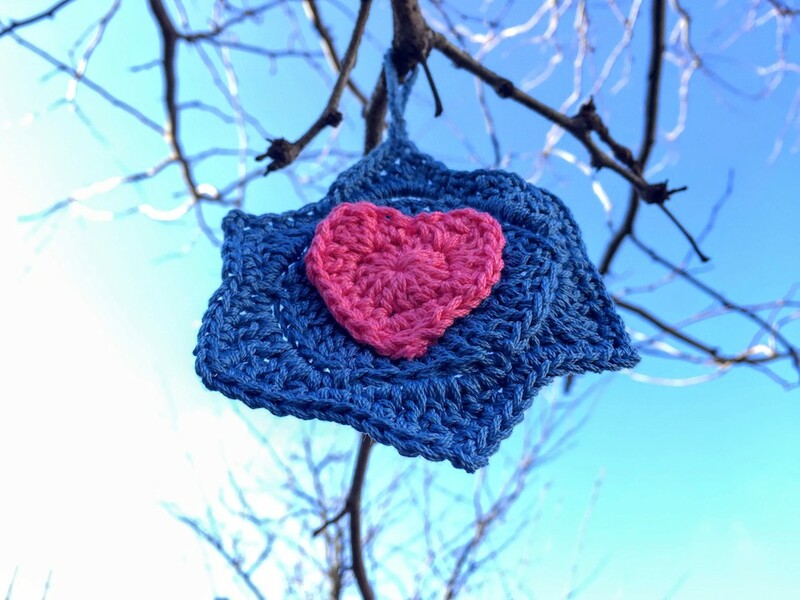 Dozens of bears hang from the fence and nearby telephone pole: in a bow tie and with a Valentine’s heart, dressed in a Scotsman’s plaid and with matching Christmas hat and scarf, still buoyantly wide-eyed awake and drooping limply with the weight of the world. 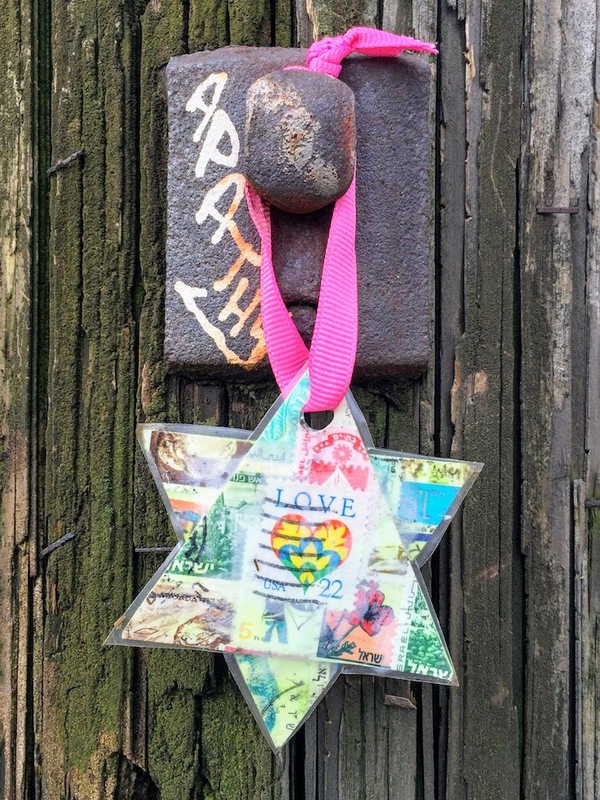 The long, east-west alleys of Homewood are, like many sets of children born to the 1970s, group-named with a common initial letter: Ferdinand, Fletcher, Fuchsia, Fielding, Forest, Felicia, Fleury. Heading south, the very last of these–before you cross Hamilton Avenue and both street grid and naming scheme change–is Formosa Way. The little alleyway is typical of many old Pittsburgh backstreets–a single lane, weedy, cracked, and stained with decades of practical use and a typically low seat on the Department of Public Works priority list for maintenance. Formosa Way runs parallel between Kelly Street and Hamilton Ave. and (at least at one time) was the main entrance for many row houses that fronted the alley for blocks in either direction. All things considered, the 7300 block of Formosa Way looks a whole lot better than many Pittsburgh alleys. There’s next-to-no litter, nor signs of illegal dumping. The backyards of the row houses facing the adjoining streets may be untamed, but are now lush, tall-grassed expanses that bring welcome deep green open space to what at one time must have been dense blocks of brick worker housing. 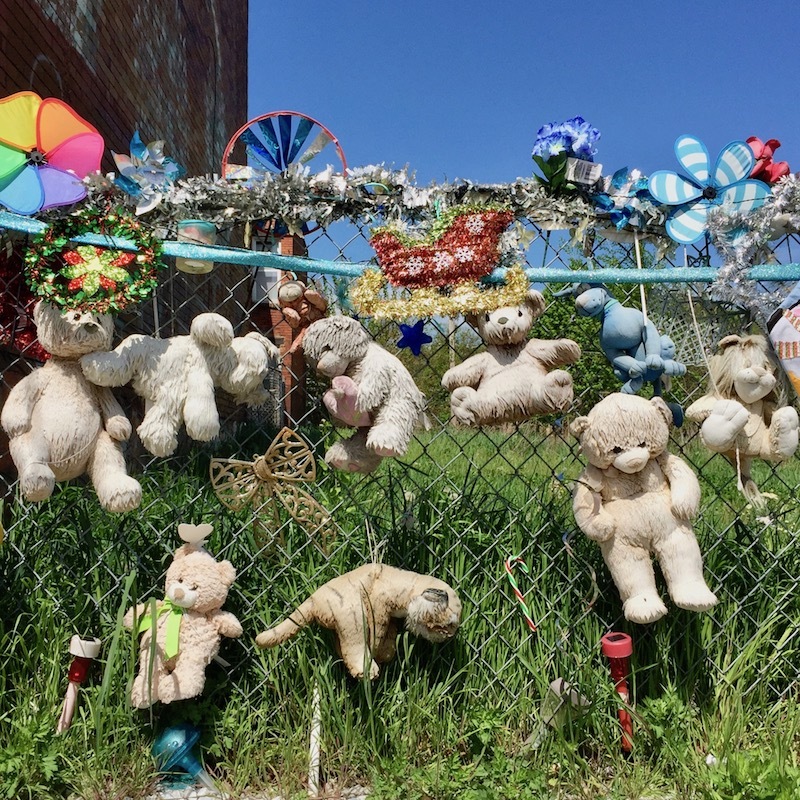 What’s not so expected is the stretch of thirty-some feet of chain link fence, now bordering an overgrown vacant lot, plus one service pole across the alley. 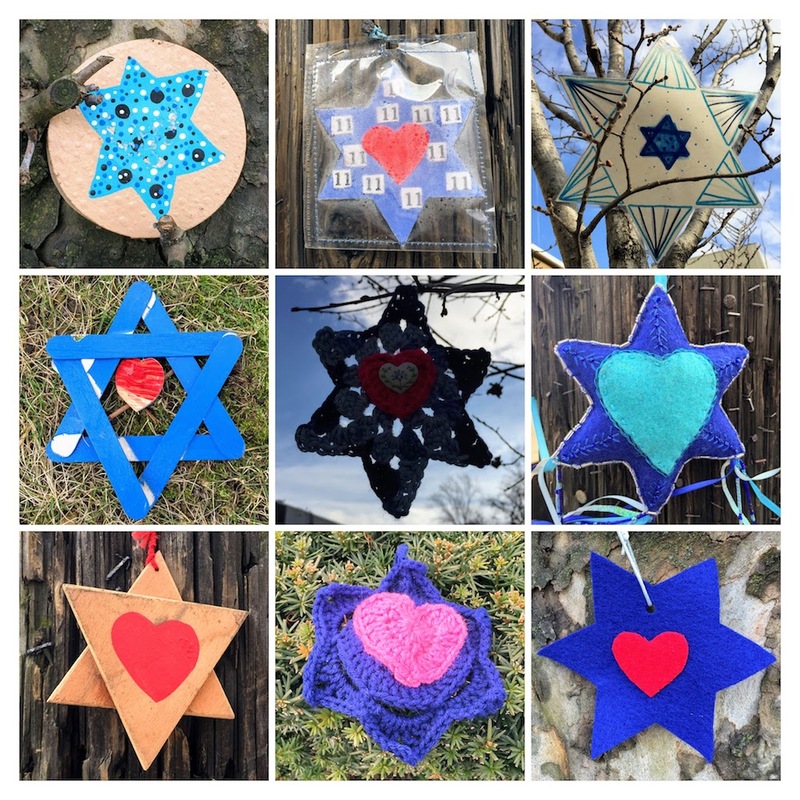 Attached to the intertwined steel strands and lashed to the wooden pole are scores–a hundred or more–soft children’s playthings along with assorted pinwheels, holiday decorations, and Christmas garland. 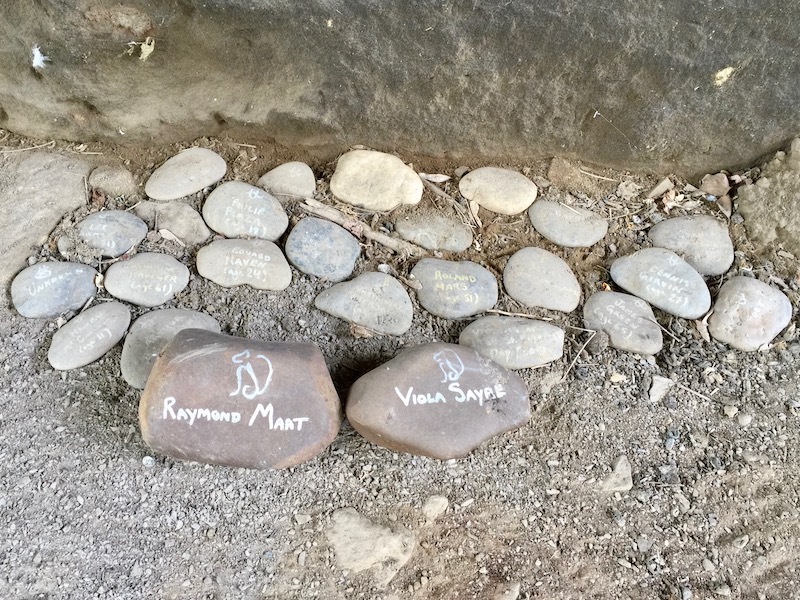 These tributes have clearly been here for some time: their synthetic fur is matted, gnarled, and bleached white in years’ worth of sun, rain, frost, and thaw. It’s a strange realization that the small patch of earth one has bicycled-through mere hours before is known locally as The Killing Fields…or, at least, it was at one time*. That particular name arrived during the crack-fueled gang violence of the 1990s, but persisted (we understand) until quite recently. Right here at Formosa and Collier, several blocks of derelict housing were razed in 2012*. 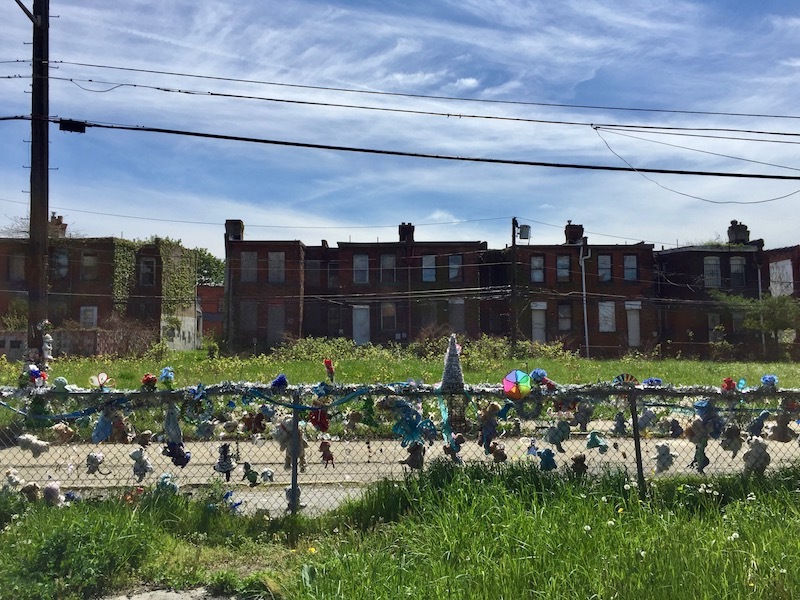 A short set of five boarded-up row houses immediately adjoining the fence appear headed for the same fate. That said, on this fine, bright sunny Sunday early afternoon, the blocks around Formosa Way feel much more like the Sunday-go-to-meetin’ fields or the wash-the-car-with-the-radio-on fields. 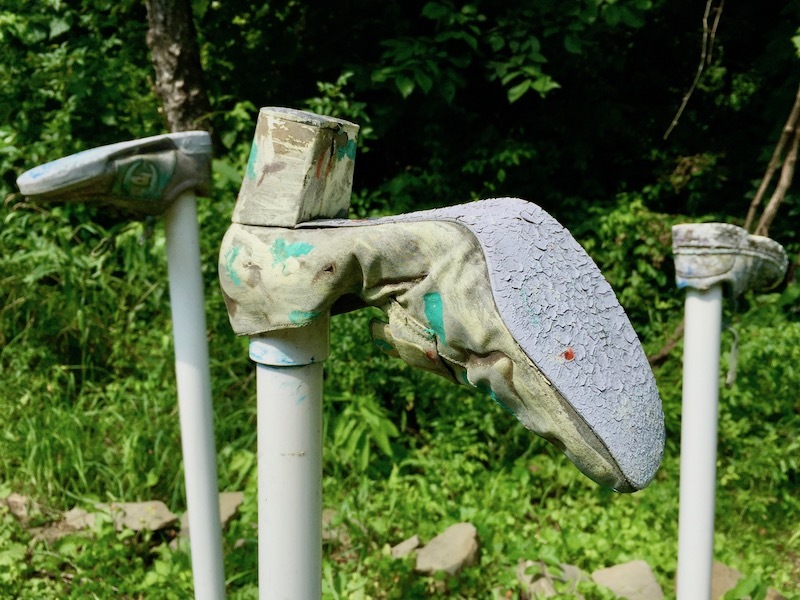 Those activities, along with stoking up big barrel charcoal grills and neighbors swapping gossip on front porches are the most obvious occupations to the peddle-by blogger. 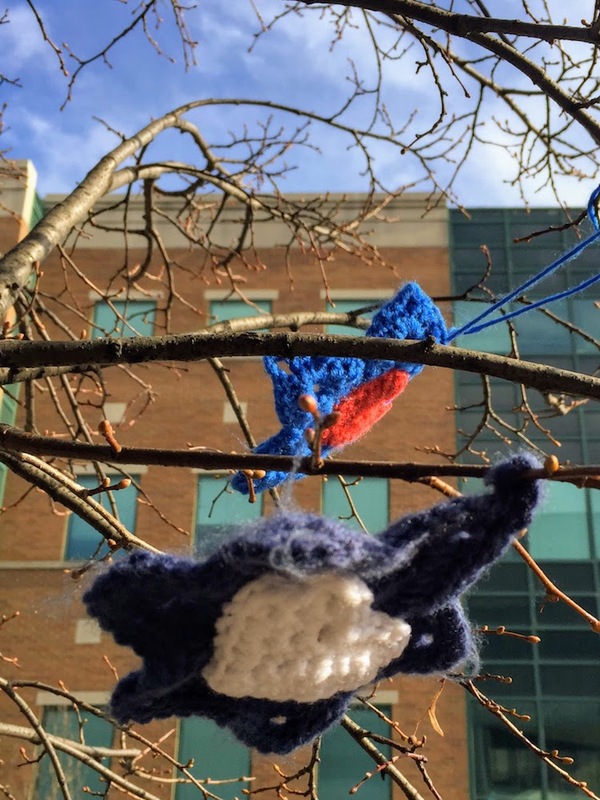 No label is attached to the fence of sad toys, there is no description for the installation, and attribution for the collection is not given. But what’s here seems obvious enough for even the densest of outsiders to put two and two together. 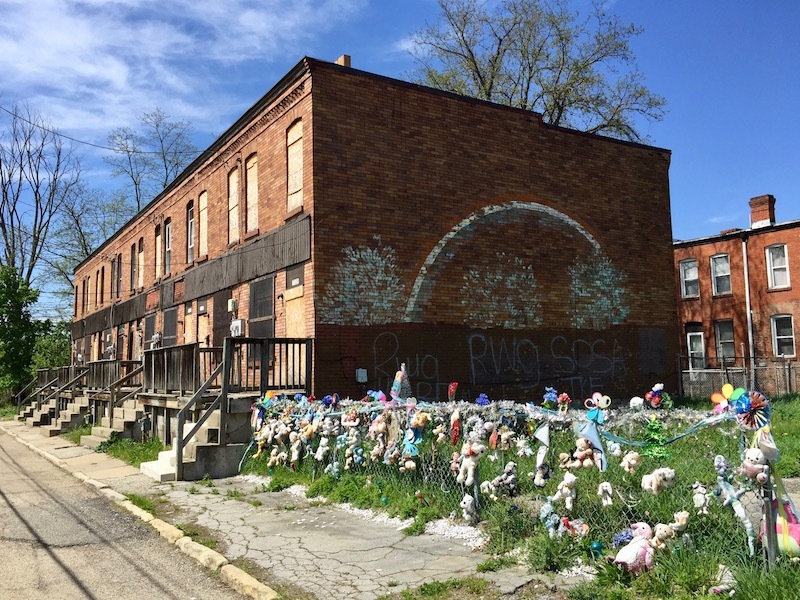 This pair of diametrically-opposed and inseparably-linked events–decades of street violence and the impromptu memorial to lost innocence–say so much about the deep loss generations of Homewood families must have felt. 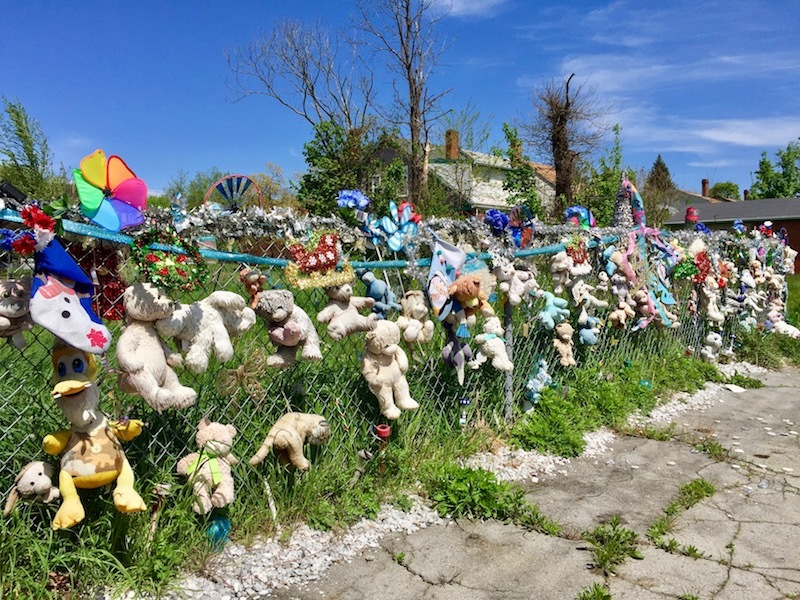 If each stuffed animal on the Formosa Way fence represents just one casualty in the neighborhood’s struggle, it is a weight no single community should have to bear. 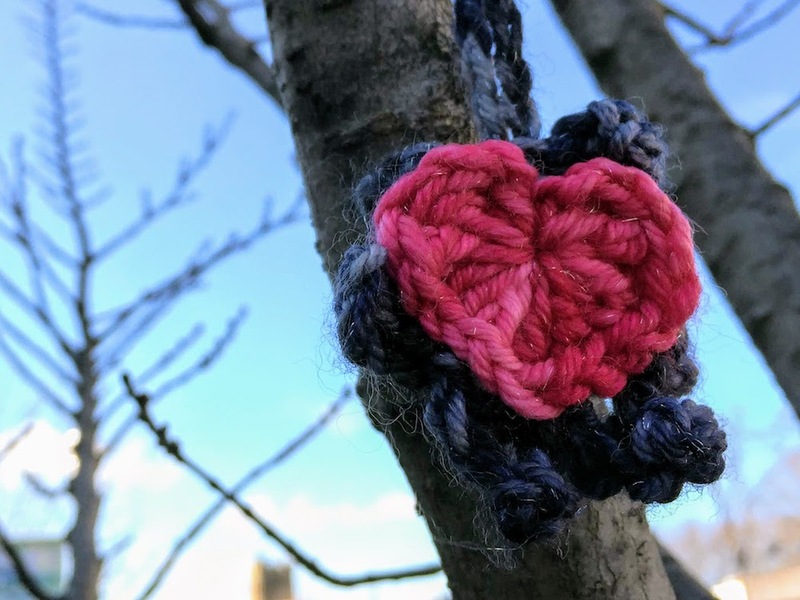 It’s more likely that not every victim received a tribute here–that a suitable memorial may need to be twice, three or more times greater to accurately represent the actual loss. For now, we can only hope the collection of playthings stops right where it is. Final note: While most Pittsburgh Orbit stories sit just fine in the quasi-legitimate world of “speculative journalism”, this one does not. 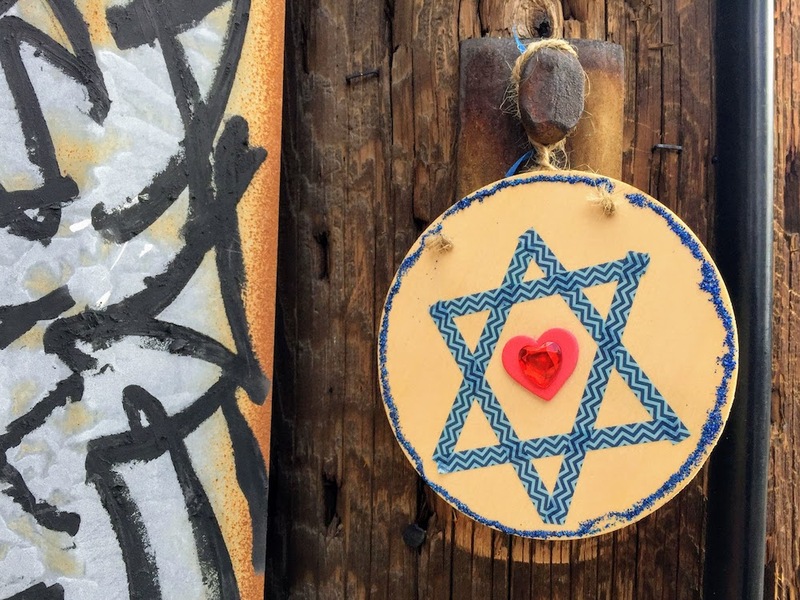 It’s crying out for more information from the Homewood community, the creators of the fence, residents of Formosa Way, etc.–we know this. Time and schedule wouldn’t allow that kind of “real journalism” for this week’s post, but we absolutely plan on continuing the story. 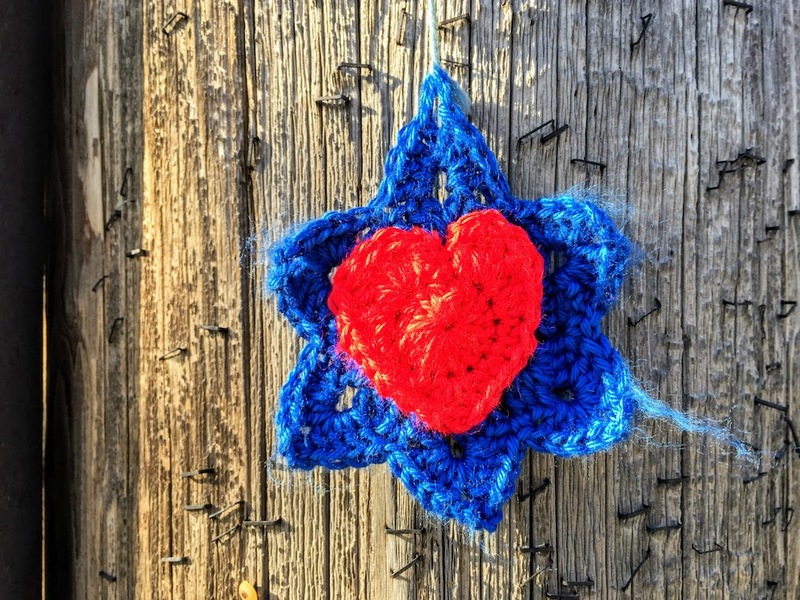 If you live in Homewood or have information on the Formosa Way fence, we would love to hear from you. 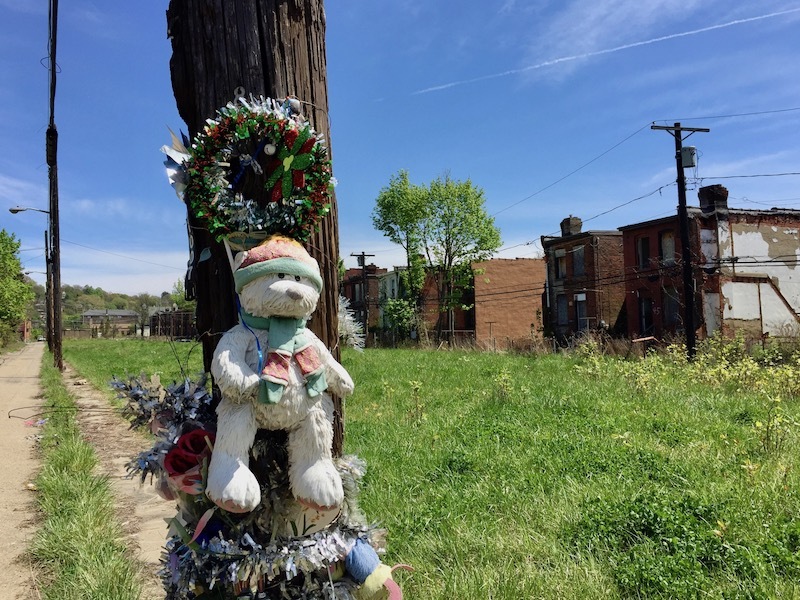 * “Demolition gives Homewood residents hope”, Joe Smydo, Pittsburgh Post-Gazette, April 5, 2012 and “The ‘killing fields’ demolished in Homewood”, New Pittsburgh Courier, 2012.